The Gay Gamer: Who you callin' a roguelike rookie? Not me, I hope. I know I only broke my roguelike cherry a short while ago, but in the last few weeks I've gone from roguelike virgin to roguelike whore--or at least from rogulike virgin to roguelike non-whore-who-still-likes-to-do-it. What's funny (well, it's funny to me at least) is that I could have popped that proverbial cherry a few years ago--after I bought Final Fantasy Fables: Chocobo's Dungeon. I actually played through the game's first chapter shortly after I bought it, but then I promptly put it away--and didn't pick it up again until a few weeks ago. Final Fantasy Fables: Chocobo's Dungeon isn't the only roguelike I'm trudging through--I'm also working my way through two roguelikes from the Super Famicom era, thanks to the wonders of fan translation: Fushigi no Dungeon 1 and 2 (aka Torneko's Great Adventure and Shiren the Wanderer, respectively). 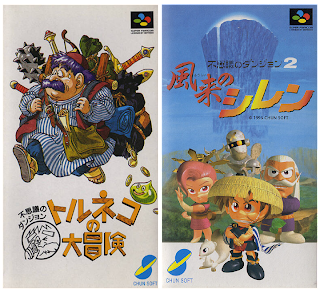 Once I'm done with the three roguelikes mentioned above, I'll probably track down two more: Chocobo's Dungeon 2 and Torneko: The Last Hope, both of which were released for the original PlayStation back in 1999 and 2000, respectively. THAT's what I was supposed to look for! I got on Amazon this weekend and went, "I know Bryan told me to look for something..."
And I just realized that I think I submitted your name wrong for Hardest Level posts when I was doing them. I think spelled it with an "i" instead of a "y". My apologies.